Even though barbecue season is over (or perhaps it’s not if you’re one who insanely barbeques right through the winter like I do) it doesn’t mean you can’t enjoy a great burger! 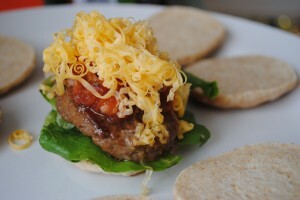 I wanted to show how you can take one very simple everyday item such as a basic hamburger, and dress it up in different ways to make three completely different dishes! 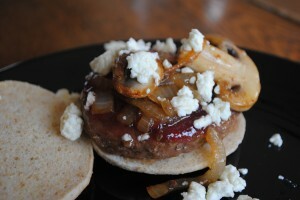 Here is a mini burger inspired by a recipe in the PC Insider’s Report, topped with cranberry sauce, feta cheese, caramelized onions and mushrooms. It was superbly delicious! The exact same burger is changed up and topped with some lettuce, fresh salsa and grated cheese – guacamole and sour cream would also be delicious additions to this Tex Mex variation – Ole’! Need a third idea? Well, I haven’t tried this yet, but an Asian flare could easily be added by topping with cilantro, bean sprouts and hoisin sauce or even a spicy Thai or peanut sauce. I always tell people to play with their food. Trying new and exciting flavour combinations should be fun and fearless! You’ll never know the wonderful possibilities you can create until you play around. Wow nice blog. I discover your site by way of Google and I am thankful that it brings me to your site. Keep on Posting and Thanks for Sharing.